The Federative Republic of Brazil is a union of 27 federated units (Portuguese: Unidades Federativas, UF): 26 states (estados) and one federal district (distrito federal). The states are generally based on historical, conventional borders which have developed over time. The Federal District cannot be divided into municipalities, according to the Brazilian Constitution, the Federal District assumes the same constitutional and legal powers, attributions and obligations of the states and municipalities, instead, it is divided by administrative regions. The codes given below are defined in ISO 3166-2:BR. The present states of Brazil trace their history directly to the captaincies established by Portugal following the Treaty of Tordesillas which divided part of South America between Portugal and Spain. 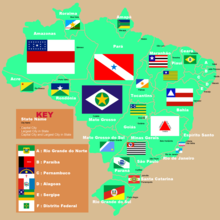 The States of Brazil, their respective flags, their state capitals, and their largest cities. The first administrative divisions of Brazil were the hereditary captaincies (capitanias hereditárias), stretches of land granted by the Portuguese Crown to noblemen or merchants with a charter to colonize the land. As the map shows, these divisions generally followed lines of latitude. Each of the holders of these captaincies was referred to as a captain donatary (capitão donatário). These captaincies were to be passed from father to son, but the Crown retained the power to revoke them, which the King indeed did in the 16th century[disputed – discuss]. In 1549, the Portuguese Crown appointed Tomé de Sousa as the first governor-general of the vast Portuguese dominion in South America. This dominion overall became known as the State of Brazil (Estado do Brasil). In several periods of history, the northern half of the dominion was detached from the State of Brazil, becoming a separate entity known as the State of Maranhão. Maranhão by then referred not only to current Maranhão, but rather to the whole of the Amazon region; the name marã-nã in old Tupi language means "wide river", referring to the Amazon River. After the Iberian Union (1580–1640), the territory of Portuguese colonial domains in South America was more than doubled, and the land was divided into hereditary and royal captaincies, with the latter being governed directly by the Crown. Unlike Spanish America, the whole territory remained united under a single governor-general (with the permanent title of viceroy after 1720), based in Salvador (after 1763, in Rio de Janeiro). This arrangement later helped to keep Brazil as a unified nation-state, avoiding fragmentation similar to that of the Spanish domains. In 1759, the heritability of the captaincies was totally abolished by the government of the Marquis of Pombal, with all captains becoming appointed by the Crown. The captaincies were officially renamed "provinces" on 28 February 1821. With independence, in 1822, the former captaincies became provinces of the Empire of Brazil. Most internal boundaries were kept unchanged from the colonial period, generally following natural features such as rivers and mountain ridges. Minor changes were made to suit domestic politics (such as transferring the Triângulo Mineiro from Goiás to Minas Gerais, splitting Paraná and transferring the south bank of the São Francisco River from Pernambuco to Bahia), as well as additions resulting from diplomatic settlement of territorial disputes by the end of the 19th century (Amapá, Roraima, Palmas). When Brazil became a republic in 1889, all provinces immediately became states. In 1943, with the entrance of Brazil into the Second World War, the Vargas regime detached seven strategic territories from the border of the country in order to administer them directly: Amapá, Rio Branco, Acre, Guaporé, Ponta Porã, Iguaçu and the archipelago of Fernando de Noronha. 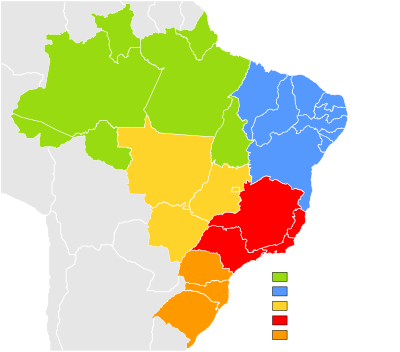 After the war, the first four territories became states, with Rio Branco and Guaporé being renamed Roraima (1962) and Rondônia (1956), respectively, whilst Ponta Porã and Iguaçu remained as territories. In 1960, the rectangular-shaped Distrito Federal was carved out of Goiás in preparation for the new capital, Brasília. The previous federal district became Guanabara State, but in 1975 it was merged with Rio de Janeiro State, retaining its name and with the municipality of Rio de Janeiro as its capital. In 1977, Mato Grosso was split into two states. The northern area retained the name Mato Grosso while the southern area became the state of Mato Grosso do Sul, with Campo Grande as its capital. The new Mato Grosso do Sul incorporated the territory of Ponta Porã and the northern part of Iguaçu. Central Iguaçu went to Paraná, and southern Iguaçu went to Santa Catarina. In 1988, the northern portion of Goiás became the state of Tocantins, with Palmas as its capital. Also, the archipelago Fernando de Noronha became part of Pernambuco. The government of each state of Brazil is divided into executive, legislative and judiciary branches. The state government constitutes the executive branch in each of the states. It is headed by a state governor and also includes a vice-governor, several secretaries of state—each one in charge of a given portfolio—and the state attorney-general. The state legislature branch is the legislative assembly, a unicameral body composed of state deputies. The judiciary in each of the states is made up of a Court of Justice and the judges of law. The judges of law constitute courts of first instance. The Court of Justice is the court of second instance of the state and is composed of judges called desembargadores. On 11 December 2011, a consultative referendum was held in the state of Pará about splitting that state into three new ones (Pará, Tapajós and Carajás). Both Tapajós and Carajás were rejected by the population by approximate margins of 2:1, despite being heavily favored in the proposed breakaway regions. ^ "Voters Reject Division of Brazilian State". Americas Quarterly. December 13, 2011. ^ "Acre". www.brazil.org.za. Retrieved 2019-04-04. ^ "Ceará". www.brazil.org.za. Retrieved 2019-04-04. ^ "Goiás". www.brazil.org.za. Retrieved 2019-04-04. ^ "Maranhão | state, Brazil". Encyclopedia Britannica. Retrieved 2019-04-04. ^ "Mato Grosso | state, Brazil". Encyclopedia Britannica. Retrieved 2019-04-04. ^ "Mato Grosso do Sul | state, Brazil". Encyclopedia Britannica. Retrieved 2019-04-04. ^ "Paraíba | state, Brazil". Encyclopedia Britannica. Retrieved 2019-04-04. ^ "Paraná". www.brazil.org.za. Retrieved 2019-04-04. ^ "Pernambuco | state, Brazil". Encyclopedia Britannica. Retrieved 2019-04-04. ^ "Rio de Janeiro (State)". www.brazil.org.za. Retrieved 2019-04-04. "Em 2012, Sudeste concentrava 55,2% do PIB do país e o DF tinha o maior PIB per capita" (in Portuguese). IGBE. Archived from the original on 19 December 2014.